At ServiceMaster Commercial Cleaning, our goal is to deliver a quality of service so good that every client will want to refer us to their friends and colleagues. We’re so confident that we will be able to deliver on that promise that we’ve developed a formal referral program to reward our clients when they recommend us to others. Since we want doing business with us to be a fun experience, and since we know you work hard and probably don’t have enough time to relax, the rewards in the program are all about giving you more chances to enjoy fun experiences. The only limit to the number of rewards you can receive is the number of referrals you give us! Qualifying referral: A tier 1 referral is a large facility that requires daily cleaning, such as a hospital, university, or industrial building. Your Reward: When a tier 1 facility that you’ve referred to us becomes a client, we’ll give you a $500 voucher to the Martin Travel Agency to use towards any of their vacation packages, including cruises in the Caribbean, Alaska, or Europe. Qualifying referral: A tier 2 referral is a medium-sized facility requiring daily cleaning, such as a school, office park, or medical clinic. 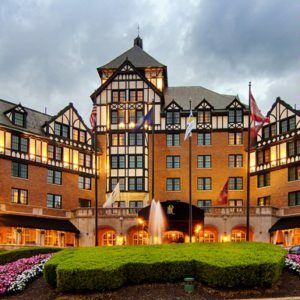 Your reward: When a tier 2 facility that you’ve referred to us becomes a client, we’ll send you on a relaxing weekend getaway to the Hotel Roanoke. You can choose from any of their getaway packages including “Blue Ridge Adventures”, “Romance in Roanoke”, or “Family Fun”. Qualifying referral: A tier 3 referral is a smaller facility requiring cleaning at least three times a week, such as a small professional office. Your reward: When a tier 3 facility that you’ve referred to us becomes a client, you can enjoy a night out on the town on us! This package includes dinner for two at one of three 5-star restaurants in our service area: The Summit (Christiansburg), The River and Rail (Roanoke), or Bull & Bones Brewhaus & Grill (Blacksburg). We’ll even throw in some movie tickets so you can catch a show after dinner! Alternative Reward: Choose Your Own Adventure! Not interested in any of the above rewards? No problem—you can choose to receive a VISA gift card of equivalent cash value to whatever reward you are eligible for after a qualifying referral becomes a client.